I usually try to read novels that will help me get into the spirit of the season and thought you might like to hear of some great books with just the right amount of 'eerie' to get you in the mood for Halloween. The most recent title I've chosen is "The Birthing House" by Christopher Ransom. This novel is about a couple from Los Angeles who move to an old house in Wisconsin. Then when the previous owner of the House pops by with a crate of things that belong “to the House”. The husband makes the mistake of looking at the photo album and discovers a strange picture of a group of women, one of whom looks very much like his wife. Deftly plotted and chillingly disturbing, this debut novel is a fine example of the horror genre. Another ghostly tale is "Hold my hand" by Serena Mackesy. In this novel single mother Bridget Sweeny and her daughter start over, with new names and hope for the future. Bridget has agreed to act as caretaker for a manor house in Cornwall. The house has a reputation in the village and Bridget and her daughter find that their idyll is not what they hoped for. Their story intertwines with that of a girl who was evacuated from London during the Great War and sent to the house to be under the care of a dysfunctional and evil family. I saved the best for last! 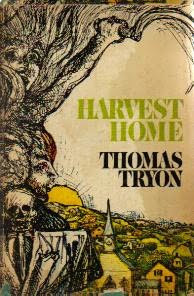 My all-time favourite chilling tale is the novel "Harvest Home" by Thomas Tryon. This one will give you nightmares! A New York couple and their daughter move to a quaint country village in New England hoping to settle into a tranquil existence. They found that the locals were obsessed with ancient pagan rituals and that the village was seemingly controlled by the Widow Fortune, an old woman with a knack for healing. The town had a secret, and its insular townspeople were all in on it. Determined to discover what that secret was leads the protagonist to find that some secrets are best left undiscovered. This novel was made into an excellent TV mini-series entitled "The dark secret of Harvest Home" starring Bette Davis as the Widow Fortune.